This collection of buildings forms a rare intact example of the type of structures used in the domestic economy of rural Newfoundland during the 19th and 20th centuries. It includes a house, stable, carriage house/workshop, store, fencing, gate, gardens and rock-lined root cellar that accommodated the agricultural and fishing activities typical of the families in Conception Harbour until the mid-20th century. The property has been in the Trahey family name since before 1800. The dwelling house was constructed circa 1914-1915. A view of the carriage house, twine loft, outhouse, barn, cellar, workshop, and house. The steep roofed structure of the group is the store, which housed a carriage, and in the loft above, nets, twine and other fishing gear. The middle flat roofed shed was a carpenter shop. The largest two storey building was the barn or stable, which predates the house. The barn housed the horse, cow, sheep, goats, hens and pigs. The horse's manger remains intact as does the hen house. Except for the absence of livestock, the buildings have served in the same capacity since the time of their construction, and all original implements and equipment remain within. 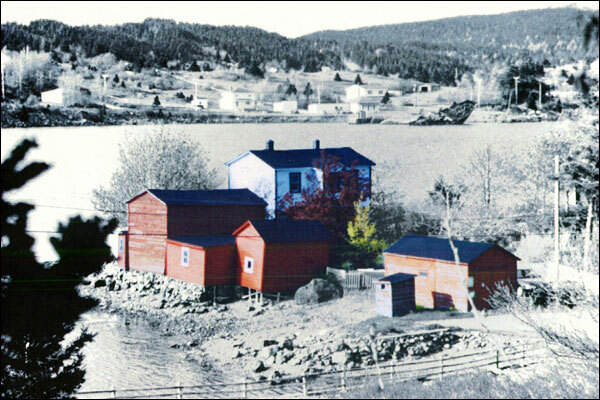 The structures exemplify the close functional relationship between the various spheres and spaces associated with the rural Newfoundland domestic economy of the 19th and 20th centuries - on the one side the domestic structure and gardens for agricultural production and on the other the harbour where a wharf and small boats were kept and maintained. These structures stand at one end of a point of land used historically for wood-cutting, livestock grazing and agricultural production. The site is sheltered by a promontory on the north side and by a small hill (locally called a "tolt") on the opposite side of the pool. The prominence of the site in Conception Harbour has made this collection of buildings and the adjacent domestic structure a landmark in the community. The vista of these buildings from the public wharf has been reproduced frequently as an image of archetypical rural Newfoundland vernacular architecture in various media, fine art, photography, calendars, greeting cards and road maps. Also view Trahey Property Registered Heritage Structure on the Heritage Foundation of Newfoundland and Labrador web site. The Newfoundland and Labrador Heritage Web Site has on its site only a portion of the registered heritage structures in Newfoundland and Labrador. To view a complete list or search for a particular structure visit the Heritage Foundation's Property Search page.